Popup ads embedded in website video players are a common feature these days. An ad starts playing at a certain point during the video, with the option of skipping after a few seconds, a la YouTube. However, the user response to these ads is mostly negative, because any disruptions when watching a video affect the viewer experience. 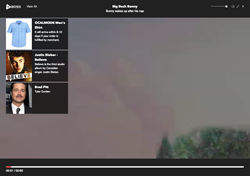 The new Boss Video Player sidesteps this hassle by offering customization features for content providers. A spokesperson for Boss Video Player stated, “We are incredibly proud to announce the launch of our Boss Video Player. Our team, featuring experienced programmers, has worked tirelessly to provide video content providers a customizable video player that allows viewers to interact with the content in a seamless manner. Our extensive and diligent research showed disrupting the viewing experience with popup ads is not an effective strategy and we now offer the ideal solution”. The Boss Video Player offers users an easy-to-use Back Panel, which they can use to incorporate any information or links they want. The information will display whenever the viewer pauses the video. The sleek video player can be used on any device, offering content providers the chance to target a wide audience. The Boss Video Player is poised to enhance and change the way viewers interact with video content on the web. The team behind Boss Video Player boasts a combined leadership experienced of over three decades, with highly experienced and competent programmers at the helm. Interested parties can request a demo for the video player directly through their website. You can learn more about Boss Video Player and the team behind it @ http://bossvideoplayer.com/.